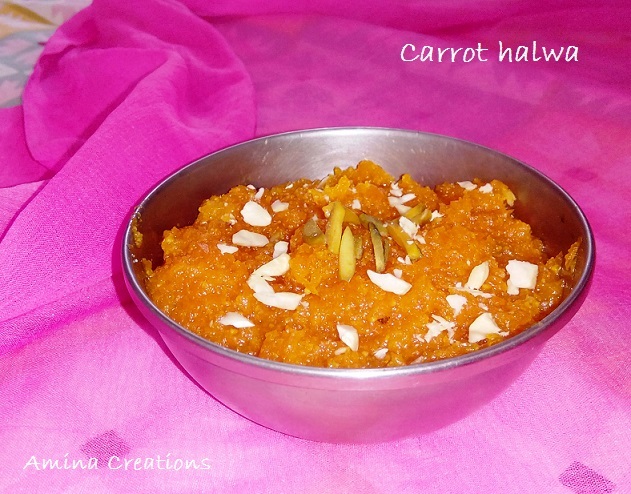 I have already shared a post on how to make carrot halwa by slow cooking in an open pan. And today I am going to share a short cut method of cooking carrot halwa in just 15 minutes in a pressure cooker. I have added condensed milk along with milk in this recipe. For more sweet recipes, check out the Sweets recipe page. Melt ghee in a pressure cooker, add 3/4th quantity of dry fruits and saute till they turn golden. Add grated carrots along with milk and mix well. Close the lid of the pressure cooker and pressure cook for 1 whistle and switch off the gas. When the pressure has released, open the lid of the cooker and switch On the gas. Add sugar now and continue cooking for about 5 minutes..
By this time, most of the liquid would have evaporated..
Now add cardamom powder and condensed milk and mix well. After a couple of minutes, switch off the stove. Transfer to serving bowls an garnish with the remaining chopped nuts on top. Serve warm or refrigerate for a few hours and serve cold. Carrot halwa stays fresh when refrigerated for up to 1 week. Pressure-cooker will help save precious fuel.